A friend stops by regularly to bring over delicious apple pies. She does this almost every other week out of the goodness of her heart. She’s generous by nature, and doesn’t expect anything back in return. I take the pie. I thank her, yet focus and rely on her bi-weekly apple pies. Never, do I call her to come over for some coffee and talk. We see each other on the street, say our ‘hellos’ and then move on. Her pies still keep coming like clockwork. Instead of relying on her “pies”, I should be appreciating the “creator” of the pies- my neighbor, right? Who made the earth? God. In my belief, God is the Creator of all things. My primary focus is not earth, metal, wood, fire and water. It’s God. God, who has made all things beautiful for us to enjoy. 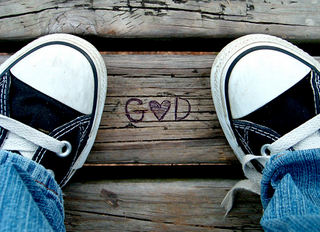 God, who has made each and every one of us, who still bicker over who’s right and who’s wrong. A brother and sister fight over who’s the better sibling. The brother says, “Well, I take out the garbage every single night, while you sit there and do nothing.” The girl responds, “Nothing? Nothing? I clean up after you and wash the dishes at night, while you sit there doing nothing!” For hours, the sister and brother continuing arguing over who’s the ‘better child’. “At least I don’t sneak out in the middle of the night like you do, to meet your boyfriend,” the brother says all proud, “mom and dad would totally punish you for that!” The girl looks at her brother and says, “You have some nerve! I’m not the one who sits at his computer and watches dirty websites you perv!” They both remain silent looking at one another, realizing that they both have different faults of their own. Which child do you think the parents love the most? We try the best we could to be the perfect “Christian”, or the perfect person in whatever religion we practice, yet we still have people among us, (brothers and sisters) who will compare one sin over the other. Even if the sister was condemning her brother ‘out of love’, it’s not her place to sit there and tell him what to do. Maybe she can ‘suggest’ a better idea, however, belittling him only generates more anger and resentment. Their parents love them regardless. They wouldn’t ever let them go, even if they did find out about the daughter sneaking out at night and the son tapping into that dirty website. Most parents would talk it over, try to correct them, and of course, punish them for their ‘wrongs’, but never, would they cast them to another household. (Hell) The brother and sister love their parents with all their heart. And maybe they will continue on doing what pleases them, however, it doesn’t mean the parents will disown them. Each child has their own personal relationship with their parents. I am frustrated with other Christians. It literally makes me want to change religions altogether, but I’ve already developed a strong relationship with God, so I can’t. I know He exists. I know He hears me when I pray and I know that He realizes my frustrations with other people. I got too caught up with other people’s judgments, when I should have been more focused on the Lord. Those “bad eggs” that come onto my website aren’t bad eggs, they’re just misguided in my opinion. They’re ugly in spirit and see things in a negative outlook. I find them to be insecure about who they are. They’re also seeking answers. Why would they lash out so harshly? I’m readily to admit my inquiries about God and what’s right and wrong. God wants us to come to Him as a child. He wants us to ask questions and keep seeking for the truth. None of us have 100% wisdom to know every answer. We can claim we do, but then our journey would end there. We need to grow in Christ and claim Christianity in the way that suits God best, and the way that suits us best. Glorify Him, and we’ll reap the rewards soon enough. We don’t have to be perfect humans in order to be loved by God, we just have to be vulnerable and willing to learn with opened hearts. Why is everyone’s relationship with God a question to other people? Do they know your salvation? Do they know where you’re going in the afterlife? They can read the bible as much as they want, theologians can bop you on the head with their good book, but have they studied the written word in their hearts? There’s so much more depth in reading a passage in the bible. I can write a sentence, have it mean one thing to one person, and have it mean something totally different to another. Maybe I want it that way. Maybe I want them to interpret it on their own and find their own personalized paths. What does this sentence personally mean to you? Read between the lines and feel free to give me your definition of it.